Nikon Canada Inc. (Nikon Canada) offers industry leading warranty coverage on new Nikon Sport Optics products and accessories when purchased through an authorized Nikon Canada reseller. Consumers enjoy added confidence knowing their investment is protected. Nikon Canada is dedicated to quality, performance and total customer satisfaction. 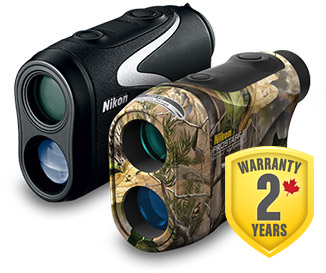 If your Nikon Binocular, Riflescope or Fieldscope requires service or repair not covered by our Limited Lifetime Warranty, just send it to us and Nikon Canada will repair or replace it. 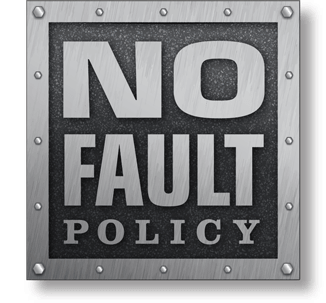 *Excludes products with electric components, lost or stolen products and intentionally caused damage. 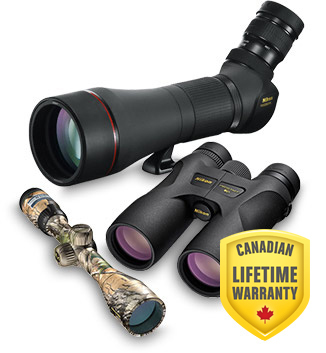 All Nikon Binoculars, Spotting Scopes, Fieldscopes and Riflescopes without electronic components purchased new from an authorized Nikon Canada reseller include a lifetime limited warranty from the date of purchase. During this period, if the product is found to be defective in material or workmanship, Nikon Canada will either repair or replace the product without charge (as long as it meets the terms of the warranty). No registration or warranty card is needed with these products; simply retain your original dated proof-of-purchase in case warranty service is needed. However, we recommend registering your product so we can send you information about future updates or service issues that may arise. Please contact your local authorized Nikon Canada reseller for more information. 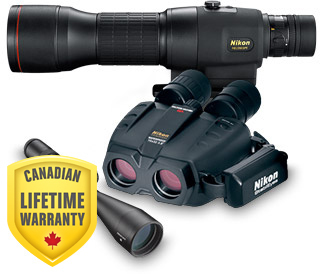 All Nikon Binoculars, Spotting Scopes, Fieldscopes and Riflescopes with electronic components purchased new from an authorized Nikon Canada reseller include a one-year limited warranty on the electronic components and a lifetime limited warranty on the non-electronic components from the date of purchase. During this period, if the product is found to be defective in material or workmanship, Nikon Canada will either repair or replace the product without charge (as long as it meets the terms of the warranty). No registration or warranty card is needed with these products; simply retain your original dated proof-of-purchase in case warranty service is needed. However, we recommend registering your product so we can send you information about future updates or service issues that may arise. Please contact your local authorized Nikon Canada reseller for more information. All Nikon Laser Rangefinders purchased new from an authorized Nikon Canada reseller include a two-year limited warranty from the date of purchase. During this period, if the product is found to be defective in material or workmanship, Nikon Canada will either repair or replace the product without charge (as long as it meets the terms of the warranty). No registration or warranty card is needed with these products; simply retain your original dated proof-of-purchase in case warranty service is needed. However, we recommend registering your product so we can send you information about future updates or service issues that may arise. Please contact your local authorized Nikon Canada reseller for more information.